After a few weeks of continuous leaks, it’s finally official. This afternoon the LG G3 has been officially launched in London, New York, San Francisco, Seoul, Singapore and Istanbul. It is a device with impressive specifications that are among the best smartphones in the market. The philosophy of the phone follows LG new smart concept, with the device learning from us to better assist the actions of everyday life. To achieve this, LG has simplified the customization layer that had the G2 and added extra features such as notices to remove apps we do not use to free memory, reminders about the weather or the scheduled appointments, etc. The main feature of the G3 is its display, which offers 2560 × 1440 pixels, with a density of 538 pixels per inch, well above most existing smartphones. This stunning Quad HD display occupies 76.4% of the available space of the front panel, leaving space only for a few small speakers on the bottom. To power this screen, the G3 has a 3000 mAh removable battery that provides sufficient autonomy for daily use. The camera deserves another mention. In addition to the 13MP sensor, it includes an innovative autofocus laser system much faster than traditional methods, even under poor lighting conditions. Thus, after clicking on a point on the screen, it focuses and shoots the photo almost instantaneously. The 2.1 MP front camera, is activated with a simple flick of the wrist. As has already been announced these recent weeks, the G3 carries a quad-core processor Qualcomm Snapdragon 801 running at 2.5 GHz. 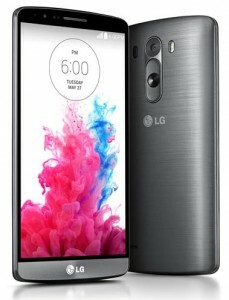 LG offers several models, with 2 or 3 GB of RAM and 16 or 32 GB of internal storage. It also has microSD support up to 128GB. It works with Android 4.4.2 KitKat customized with a sinple layer and includes some own applications like Smart Keyboard, Smart Notice and Smart Security. With these apps, LG aims to improve the user experience, following a learning concept to have the smartphone that best suits our preferences. It also has the locking touch system Knock CodeTM, which allows to easily set an unlock pattern based on a sequence of between 2 and 8 touches on specific areas of the screen. 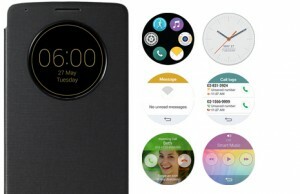 A few days ago the company presented it official case, the QuickCircle, which has a circular window through which we can check the time or get all kinds of notifications, and also can be used to recharge the battery through Qi wireless charging technology. The new LG phone keeps the system buttons on the back, as the G2, but they have been streamlined and the overall design improved. 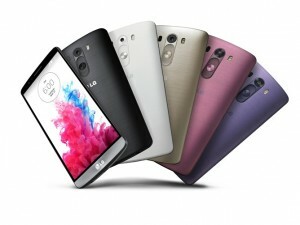 The LG G3 is available in five colors: Metallic Black, Silk White, Shine Gold, Moon Violet, Burgundy Red. It will be available in Korea on May 28th, and from there it will spread to over 170 carries worldwide.